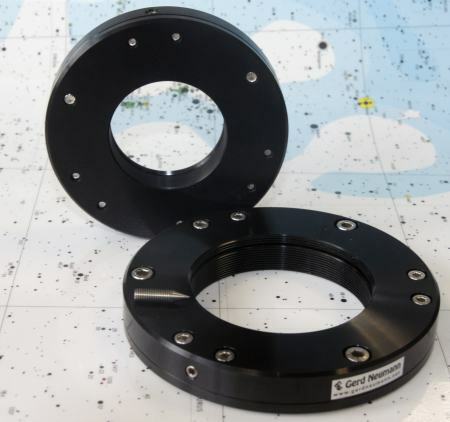 As the chips of modern CCD cameras get larger and larger it becomes more difficult to align them perfect perpendicular to the optical axis and parallel to the focal plane. Often the sensor is not mounted accurately in the camera housing and this can result in uneven sharpness and focus from one side of the sensor to the other, even though it may appear that you have mounted the camera properly. Here is where the Neumann CTU will help! The Neumann CTU allows you to adjust the tilt of the focal plane very easily and very precisely. Similar units from other manufacturers have three pairs of push-pull screws at 120° and can be very difficult to adjust. Push/Pull screws are much too coarse and a lot of adjustment is done via elastic or even plastic deformation of the main body to achieve the required image plane movements. In contrast, at the heart of the Neumann CTU are three radial screws with a very light cone shape formed at one end. By screwing these cones in, the two parts of the Neumann CTU are separated by a very small amount. A whole turn of a screw corresponds to a separation of only 0.2mm. Due to this fine movement and the large outer diameter of the Neumann CTU it is quite easy to adjust the position of the sensor to less that 1/100mm. Both sides of the Neumann CTU are held together with three very strong packs of disk springs and secured with set screws. These springs provide a very strong holding force and also keep everything together. The overall tightness of the Neumann CTU is very high so if you mount a camera with a weight of less than 3kg to the Neumann CTU, you will not have to tighten the set screws (two for each radial adjustment screw). For use with heavy imaging outfits we added the set screws to be on the safe side but it is unlikely that even heavy camera assemblies will need them but should they be needed only very slight tightened should be necessary. Here at Gerd Neumann Jr we believe our revolutionary Neumann Camera Tilt Unit will solve most problems associated with tilted focal planes that result from subtle miss alignments between camera and scope. ...but CTU knocked me out! About 1 turn on the right "screw" (the second one fit) and the stars were round. At first I thought it would cost me a whole night, because I imagined it would be very "painful", but the opposite was the case. This "thing" is simply fantastic! Your CTU is impressive! I tried so many parts with which one should be able to adjust the tilt: None worked reliably. And with your CTU, it's so easy and fast, it's hard to believe. ...I'm very excited about these two CTUs. Ingeniously simple and effective. Both image fields are now completely flat. It couldn't be better! The smaller CTU-M48 has female M48x0.75 threads on both sides. The CTU-EOS has female M48x0.75 thread on one side and the Canon EOS bajonett on the other. 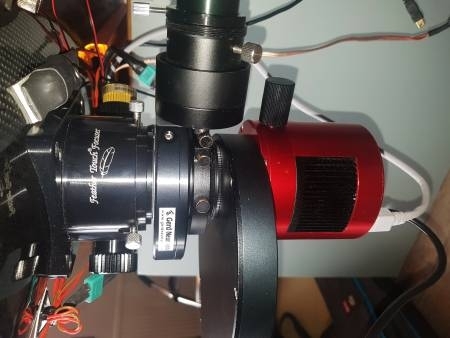 You may mount all lenses with Canon bajonett on your CCD camera and you may adujst the focal plane very carefully. A wide variety of adapters is available. The manual of the CTU is available as a PDF file upon request.